FALCONER -- A 45-year-old Sinclairville man was charged this morning with driving while intoxicated following a traffic top on Country Route 380. 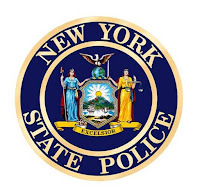 According to New York State Police, Steven Kotch was pulled over for a traffic violation and after failing several SFSTs, Kotch was placed under arrest. Kotch was transported to SP Jamestown where he provided a breath sample of .14. Kotch was then processed, issued tickets returnable to the town of Ellicott Court and released. Kotch is scheduled to appear in the town of Ellicott Court later in the month.